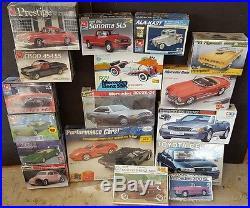 New and Used: 1 LOT of 17 Model Kits (18 models, one kit has two), all are 1/25 or 1/24 Scale. 11 sealed, 6 unsealed but complete or sealed inside as the factory made it except for 2 kits. The lot is a good bargain. Revell 1/24'71 Plymouth Hemi Cuda Convertible SEALED. AMT 1/25 George Barris "Ala-Kart" SEALED. AMT 1/25 1969 Dodge Daytona SEALED. Revell 1/25 VW Stree Machine Bug OPEN / Started (firewall glued, no instructions, body painted, frame painted, decals included). Revell 1/25 Chevrolet C1500 454 SS Open / Started (engine assembled, box smells) Complete. AMT 1/25 1962 Ford Thunderbird Convertible SEALED. Revell 1/24 Mercedes 300SL-24 SEALED. Entex 1/24 1959 Mercedes 300 SL Convertible OPEN Box, SEALED inside like factory did. Lingberg 1/24 1929 Mercedes SSK Sports Roadster Open Box Complete. Testors 1/24 1957 Mercedes 300SL Cabriolet Convertable SEALED. AMT Prestige Kit 1/25 1955 Mercedes 300SL Gullwing SEALED. JoHan 1/25 1935 Mercedes 500K SEALED. Tamiya 1/24 Mercedes 500SL Convertible OPEN Sealed inside, complete. Tamiya 1/24 Toyota Celsior Sport Sedan OPEN Sealed inside, complete. Kit Comes with one Porsche 911 and one Lamborghini SEALED. Wonderful addition for any model kit appreciators and collectors! This will make a nice gift for the modeling. Please inspect the photo as it is part of the description. I will be listing other models and items as time permits. The item "LOT of 17 Tamiya, Revell, AMT, Testors, Lindberg, Entex Auto/Truck Model Kits" is in sale since Sunday, April 30, 2017. This item is in the category "Toys & Hobbies\Models & Kits\Automotive\Vintage". The seller is "vicviral" and is located in Hudson, Florida. This item can be shipped to United States, Canada, United Kingdom, Denmark, Romania, Slovakia, Bulgaria, Czech republic, Finland, Hungary, Latvia, Lithuania, Malta, Estonia, Australia, Greece, Portugal, Cyprus, Slovenia, Japan, China, Sweden, South Korea, Indonesia, Taiwan, Thailand, Belgium, France, Hong Kong, Ireland, Netherlands, Poland, Spain, Italy, Germany, Austria, Russian federation, Israel, Mexico, New Zealand, Philippines, Singapore, Switzerland, Norway, Saudi arabia, Ukraine, United arab emirates, Qatar, Kuwait, Bahrain, Croatia, Malaysia, Chile, Colombia, Costa rica, Panama, Trinidad and tobago, Guatemala, Honduras, Jamaica.